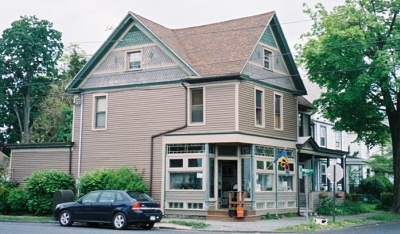 AIR (Artists-In-Residence) Studio Gallery is located in the heart of midtown Kingston, NY. This historic Kingston colonial storefront is over 100 years old and was built, owned & lived in by the same family until we bought it in 1991. We have lovingly restored and upgraded this beautiful building without sacrificing any of its antique integrity. With over 3000 square feet, 10 foot ceilings, Chestnut woodwork, stain glass panels and 5 bedrooms, the old world charm remains intact. We continue to run AIR Studio Gallery as an artists community cooperative making the space available to artists & musicians for music & art events of all kinds. Exhibitions, receptions, classes, childrens art parties, concerts, CD release parties, poetry readings and more have all occurred here. The storefront studio gallery has an awesome ambiance and dynamic acoustics. We have a superb in house, stereo 8 channel sound system with digital audio and video recording for live CD and DVD recordings.